The International Valentin-Rathgeber-Society Oberelsbach e.V. has assembled all contributions of the symposium of the year 2007 together with further articles as well as all festive sermons of the anniversary year in one volume and dedicated this symposium volume on the occasion of his 85th birthday to the jubilarian as a lifetime achievement award. The volume "I. 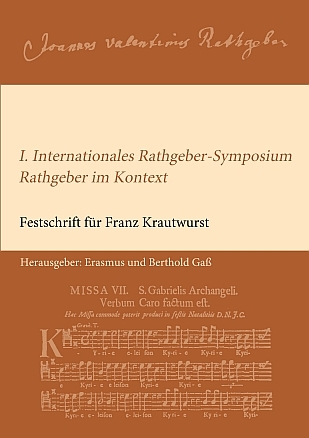 International Rathgeber-Symposium - Rathgeber in Context" covers over 300 pages. It is an important source of information and casts especially light on the context and the reception history of Rathgeber.